The Real Estate development division of Crown Isle Resort and Golf Course Community, Silverado Land Corp., is quickly expanding with the addition of two major subdivisions: The Rise Phase III & IV (69 Lots total); and the final extension of Crown Isle Drive - Cambridge Park Estates Phases V & VI (67 Lots total). Site services and road work is underway for Phase III & IV of The Rise is expected to be completed in late April / early May. The final Crown Isle Drive extension, Cambridge Park Estates, is at the City for final approval and is slated to begin road work and servicing in early March. Lot prices in The Rise start at $195,000 while lot prices in Cambridge Park Estates start at $250,000. Many lots are already reserved in both subdivisions. Make your inquiries now to find out more about the beautiful Crown Isle Resort and Golf Community in Courtenay, BC on beautiful Vancouver Island. Grand Legacy Homes is one of the latest Comox Valley home builders to build new homes at The Ridge in Courtenay. 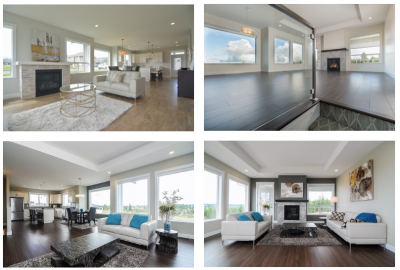 The custom home builder has just completed a five-bedroom, three-bathroom home located at 3427 Eagleview Crescent. This two-storey home is perfectly situated within The Ridge subdivision to enjoy both mountain and ocean views. It is also located conveniently close to the community park. This spacious family home is 2,650 sq. ft. and is listed for sale for $683,900. Find out more by going to MLS #434563. Grand Legacy Homes is planning more new homes in Phase II at The Ridge for lots 9, 15 and 16. Please contact Realtor Christiaan Horsfall for a tour of the existing home or for more information about a rancher/bungalow-style home that is being built soon. Budget Blinds of Central and Northern Vancouver Island is offering Buy-One-Get-One Free on their Enlightened-Style Roller/Solar and Cellular Shades for this month only. Both styles of window covering are among the most popular that Budget Blinds offers, thanks to their energy efficiency and variety of fabrics. Solar and Cellular Shades are among the most versatile window coverings available. Both are excellent and blocking sunlight to cool homes in the summer, and insulating windows to keep heat in in the winter. Solar Shades gently filter and diffuse light to create just the right ambience, block UV rays, and reduce room temperatures. They come in a wide range of styles and openness levels. Cellular Shades come in three popular cell sizes, offering varying degrees of insulation from the heat, cold and sound, enhancing your home’s energy efficiency. Light control options including sheer, light filtering, room darkening, and blackout fabrics provide you with various levels of privacy. Cellular shades are also an excellent option for those unusually shaped windows. Or add motorization to open and close those hard to reach blinds. Contact Budget Blinds of Central and Northern Vancouver Island today at 250.338.8564 to learn more about solar or cellular window shades. 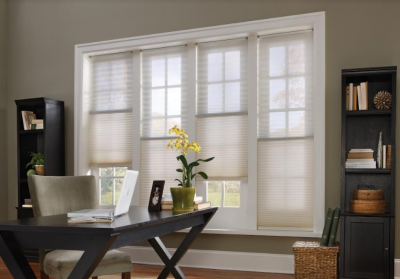 Budget Blinds’ Style Consultants are available in Courtenay, Comox, Campbell River and the surrounding areas and can design, measure, order and install your cellular shades for you so all you have to do is sit back and enjoy the view! Request a free in-home consultation today. Fourteen of the 15 units in Phase 1 and Phase 2 of Parkside Lifetyle Townhomes in Courtenay have been pre-sold. The show suite will also be for sale, but won't available for immediate occupancy. The Art Meyers/Michael Emerson team of Realtors from Royal LePage in the Comox Valley is now taking reservations on Phases 3 and 4, which will offer of an additional 18 units. Construction of these three-bedroom and 2.5-bathroom townhomes is expected to be underway soon. 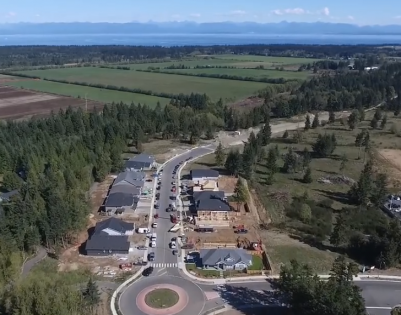 Nicon Developments Ltd., an award winning builder of new homes on Vancouver Island, has designed this development to be built to the high standard of Built Green Silver Certification. Are you thinking of selling your home? If so, contact this experienced real estate team, who would be happy to give you a free evaluation on your existing home. The Art Meyers/Michael Emerson team has been selling real estate in the Comox Valley for more than 40 years. Brando Construction's new show home in Phase II of The Ridge is Courtenay is well under way. Bill Anglin and Michelle Courtney, Realtors for Brando Construction, report that this new home will be partially completed and ready to view at the beginning of March. Learn more from their video detailing construction at The Ridge. Bill and Michelle have developed a 3-D video for a few of the floor plans that Brando Construction is building. These new homes include a single floor, rancher/bungalow style home or a two-storey home. Viewing of the upcoming homes for sale is by appointment only. 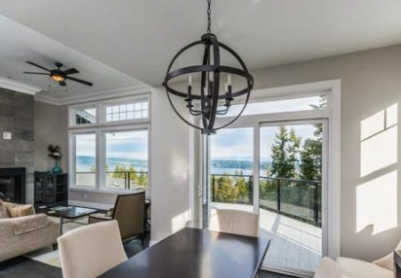 The Gales is now adding two new homes to their established community of luxury ocean view homes in Ladysmith. Two patio homes, #18 and #19, are under construction. These new patio homes are very spacious, offering 1,820 sq. ft. of living space and a large crawl space with plenty of storage. Additionally, The Gales has a three-bedroom luxury ocean view home completely finished and ready for occupancy (#16), featuring 1,000 sq. ft. on the top floor and 1,555 sq. ft. on the ground floor. This stunning new home is being offered for sale at $649,900. This award-winning, Built Green development is located in the charming community of Ladysmith on Vancouver Island.